Nandito, Flat Responsive Email Template Created by saputrad. This templates have specific characteristics, namely: Drag & drop, add, remove, arrange modules easily. Customize the color schemes, edit both text and image content. Download it in .zip file contain regular HTML and image files . You can use this Nandito, Flat Responsive Email Template on Marketing category for Aweber, campaign monitor, constant contact, corporate, drag and drop email, email template builder, flat email, getresponse, mailchimp, marketing, multipurpose email, mymail template, newsletter, responsive email, responsive newsletter and another uses. 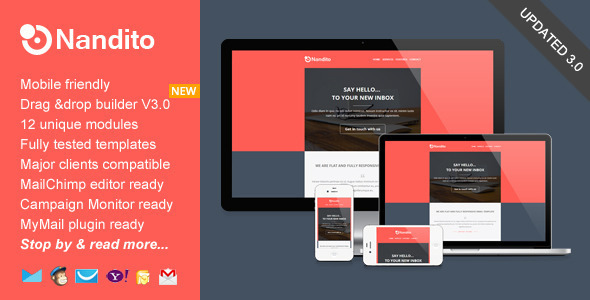 Nandito is a flat, responsive, email marketing template packed with bunch of features. Free online template builder / editor, MailChimp ready templates, Campaign Monitor & MyMail ready templates are also included. Nandito comes with flexible and repeatable modular, you can arrange the layout and build your own unique template easily. More than that, it’s also packed detailed help documentation, along with video tutorials. Whether for newsletter campaign, sponsorship email, even lead nurturing, Nanditois suitable for all of email marketing type. 1 HTML files for MailChimp template, 1 HTML files for Campaign Monitor template, 2 HTML files for MyMail WP plugin templates (in separated folder, for each of color), and 1 other for regular HTML template. - Updated Help docs. file.- Updated to the Template Builder: Added more advanced template editing features.